Hey everyone! I'm finally back with some more blog posts for you. 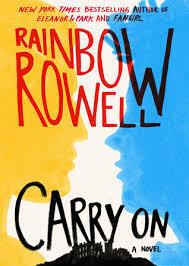 This post will be all about a book called "Carry On" by Rainbow Rowell. It's a sequel of sorts to her book, "Fangirl". The main characters of "Fangirl" are obsessed with a series called "Simon Snow". Simon Snow didn't exist, until Rainbow Rowell wrote "Carry On". You don't have to read Fangirl to understand Carry On, because it's a great book both as a sequel and as an individual. The book is a fantasy, and revolves around a magical world. Similar to Harry Potter, the book's main character, Simon Snow , was raised in a non-magical world, The difference however, between the two books, is that in Simon's world, living in a non-magical world and being magical is not possible. Although the book draws many references to old-fashioned lifestyles, it also includes it's very own modern touches. Each character has their own amount of depth, nevertheless, depth is not lacking in any main character. Some seem evil, and others good, some happy and others melancholy, but the truth is revealed spectacularly in the end. I am not a huge fan of the way the book ended, but it certainly made sense. For fear of spoiling this book for you, I will now stop writing. I hope you enjoy! Yes- clearly, so do I! I liked that part-for fear of spoilers I didn't want to include my dislike of the entire "loss of magic, growth of tail" idea.